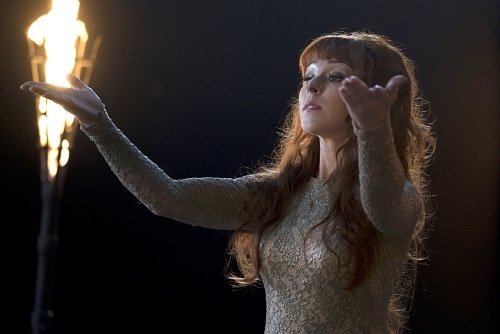 After performing a disappearing act, Rowena's back to help the Winchester brothers deal with their Darkness problem in Supernatural Season 11 Episode 9, "O Brother Where Art Thou?" And, it may have to do with a certain someone in a cage. We caught up with Ruth Connell to find out what brings Rowena back, how the reunion with Crowley goes, Rowena's reaction to Lucifer and more. BuddyTV: What brings Rowena back? Connell: Thank goodness Rowena's been pulled back in. ... There's a big cliffhanger in this episode and it very much leads into Episode 10 and we filmed the episodes together. It might actually be that the Winchesters might need something from her. I think when we last saw her, they needed her to free Castiel and here they are again. She's like their nice aunty, she keeps helping them. You'll see how she's brought back in. It's a bit of fun. Continue to read the full inteview at BuddyTV.